Crisis Intervention Team Member, Lindsay responding to a crisis call. 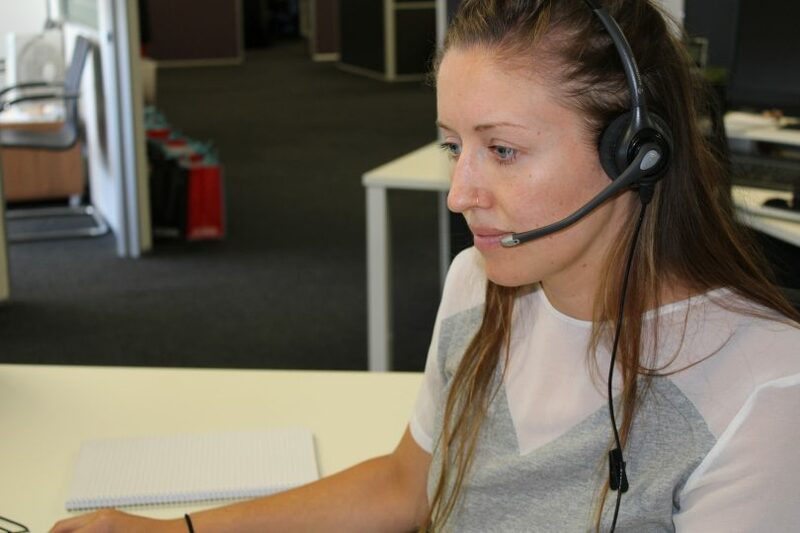 Ever wondered what it’s like to work on the front-line at the Domestic Violence Crisis Service? Lindsay, a Crisis Intervention Team Member, was kind enough to share what an average day at the DVCS looks like to her. 8 am – I’m the first one to arrive this morning, so I disarm the alarm and unlock the door. My shift partner, Reece, arrives a few moments after me. First thing I do is transfer the 24/7 crisis phone back to the office from the on-call worker last night. 8:15 am – The on-call worker calls me and gives me a handover of client calls from the night before. She advises she placed a client into emergency accommodation about 2 am. I will need to make contact with the client to assess her further needs. 8:30 am – One of our employees call in sick for the day. I let my manager know. The rest of our staff for the day are starting to arrive. Shifts on the crisis floor have staggered start times, so staff will arrive between now and 3:30 pm for the remainder of the day. 9 am – I answer the crisis line. It is a client who is seeking support after seeing our television commercial. She isn’t sure what she is experiencing. I explain what the dynamics of domestic and family violence is and let her know the services we can provide her. While on the phone to her I also obtain her consent to her becoming a DVCS client and discuss our limits to confidentiality. She consents to becoming a client. We discuss what she has been experiencing at home and safety planning. I’m glad she called us, so is she. Once the phone call has finished, I enter her on our database and write up my notes from our telephone conversation. I put her in our diary to call her again in a few days, as per her request. 9:45 am – I call the client that we placed into emergency accommodation overnight. She hasn’t slept well and is concerned about an injury to her arm. We decide it is best she go to a GP or the walk-in-clinic to get her arm checked out. She decides to call her GP and make an appointment later that day. In the meantime, she would like to meet with us to further discuss her options. I arrange to meet her at the hotel we placed her in at 2 pm that afternoon. I enter all my notes onto our database. 10:45 am – I receive a telephone call from Police. They are at the home of a woman with two children. They have arrested her husband after he assaulted her. He will be taken into custody. The woman would like to meet with us ASAP. We are advised by the Police she does not have a mobile phone. I get the client’s address and agree to come to her home at 12 noon. 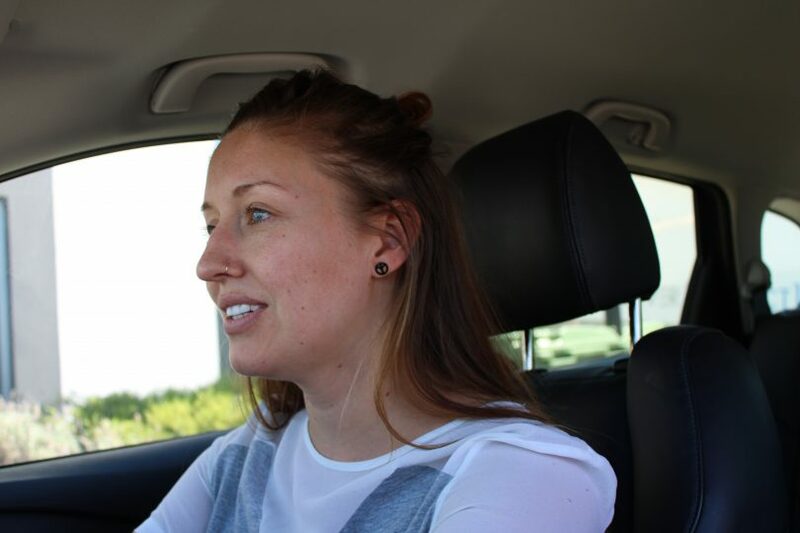 Crisis Intervention Team Member, Lindsay driving to see a client. 11:30 am – My shift partner and I decide to meet with the client at her home first at 12 noon, then go straight to the client in the hotel at 2 pm. We pack a supplies bag for the client in the hotel consisting of a breakfast and dinner pack, toiletries and a DVCS information pack. We also get a new mobile phone and SIM card (supplied as part of the Telstra Safe Connections Program) for the client at home who doesn’t have her own mobile phone. 12 pm – We arrive at the home of the woman with two children. One child is in kindergarten and at school and the other child is only three, so she is playing on the floor. The woman discloses she has been assaulted on and off for about four years, but this time he made threats towards the older child, which caused her to call the Police. She says she doesn’t want the relationship to end because she loves him, but wants him to stop using violence. My shift partner and I explain what DVCS does and how we can support her, we talk to her about Room4Change; a program for men who want to stop their use of violence and we set up the new mobile phone for her. We also discuss safety planning with her and help her to establish ways she can stay safe while in the relationship. The woman is interested to understand what is going to happen now that he has been arrested, so we talk her through the criminal justice process and how we can continue to help her with that. She is grateful for the mobile phone and our support. At this stage, she would like to stay at home with the children, but will call us if she needs any further support. 1:30 pm – My shift partner and I get back in the car and drive to the hotel where our second client is staying. Once there, she advises she hasn’t been able to get in to see her GP today, so we suggest she attend one of the Walk-In Clinics, which she agrees to do after we have left. Last night her ex-partner showed up at her house unannounced and started banging on her door and yelling. She called Police, but by the time they got there, he had gone. She decided it was safer for her to be accommodated by us, so then he wouldn’t know where she was. She would like to stay another night or so. She says she recently applied for a Family Violence Order and wonders whether that triggered him. We undertook to find out if that had been served yet and let her know. We discuss safety planning and provide her with information about staying safe at her home. This woman is already a client of ours. We have been supporting her for a couple of years now. We agree to call her again later that day to find out how her injuries are. 2:45 pm – My shift partner and I stop past and grab some take-away lunch before heading back to the office. While in the car we receive a phone call from a male client who is concerned about what he is experiencing within his relationship. He feels he is experiencing financial abuse and wants to know what that might look like. My shift partner explains what financial abuse might look like, asks if he consents to becoming a client and discusses our limits to confidentiality with him. He consents to being a client. We encourage him to call us back if he has any questions or concerns in the future. 3:30 pm – Once back at the office we stop to eat our lunch and then write up our notes from the crisis visits and the phone call we took on the way back to the office. Shift 2 staff have arrived and take over the crisis line while we eat and write up our notes. 4 pm – My shift partner and I do a handover to Shift 2 and finish up our notes before departing for the day. 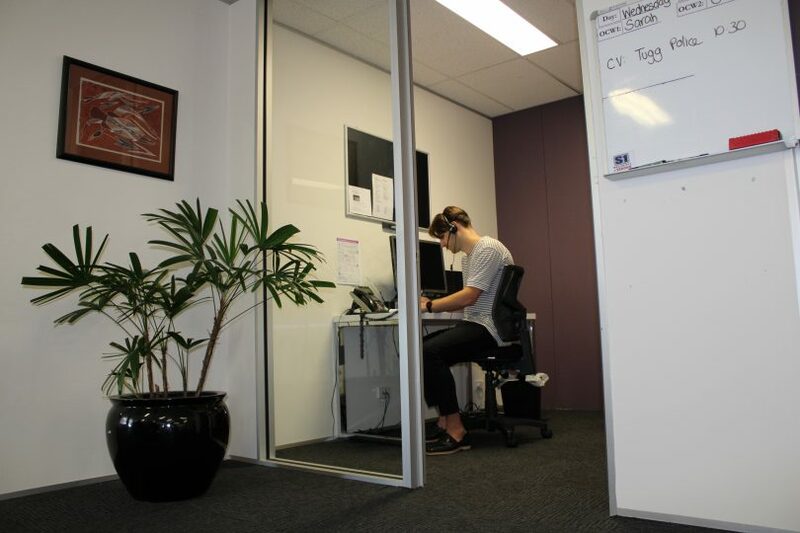 Crisis Intervention Team Member, Reece, safety planning over the phone with a client. All people at DVCS are paid employees who receive specialist training before they engage with clients. DVCS’ Crisis Intervention and Legal Advocacy team work on a 24-hour rotating roster, 365 days a year supporting those in the ACT who are experiencing family, domestic and intimate partner violence. The above is only a very, very small snapshot of what a typical day might look like for a DVCS crisis intervention team member. Every day at DVCS is different and things can change rapidly depending on the varying safety needs of each individual client at any given time. To find out more about what other services DVCS offers or if you are interested in working at DVCS, we encourage you to view their website. The DVCS is a crucial service for all those experiencing DV. It’s so important for these services to be available. Hopefully government funding will continue.